Rice bran is a bye product with potential use in human nutrition, and the availability of nutrients can be improved by fermentation processes. The effect of solid state fermentation by Rhizopus oryzae on the availability of nutrients and functional compounds in rice bran, and its possible utilization as a food source to human nutrition was studied. Rice bran and defatted rice bran samples were inoculated with R. oryzae (4 × 106 spores.g-1 bran) during 5 days, and characterized for proximate composition, phenolic compounds, and mineral levels every 24 h, and the results were compared with the Recommended Dietary Allowances. Higher protein, fibre, lipids, and mineral levels were observed after fermentation, besides an increase in the availability of phenolic compounds. Therefore, solid state fermentation of rice bran can be an alternative to improve human nutrition, besides contributing with lower deposition rates of this bye product in the environment. Rice (Oryza sativa) is one of the most produced and consumed cereals in the world, considered as staple food for more than 50% of world’s population. In 2016, total production in Brazil accounted for more than 12 tons, with 86.6% of production concentrated in the state of Rio Grande do Sul (IRGA, 2016). The steps of rice beneficiation process produce various rice fractions, including husk, bran, and polished rice. Rice bran represents from 8% to 11% of the total grain, and is obtained from the outermost covering of the rice husk, which is removed during polishing of previously peeled white or parboiled rice. Rice bran is considered a byproduct, thus its use in food may be an interesting approach due to its regional availability and low human consumption. Researchers have reported the health benefits of rice bran, for controlling blood glucose levels, lowering serum lipids and blood pressure, and assisting in the prevention and control of chronic diseases, such diabetes and cardiovascular diseases, among others . Whereas Brazil is a large agricultural producer, great amounts of agro industrial byproducts can lead to environmental problems. Thus, studies on the reuse of these products are extremely important, and an alternative approach is the use of rice bran as energy source in microbial processes, changing the metabolic activities of these organisms . However, the application of rice bran in the food industry is limited by the enzymatic deterioration, which can be prevented by a variety of methods, including dry heating. Several studies have been carried out to increase the use of rice bran in human nutrition [3-5] being a promising alternative as fermentation substrate. Several authors have shown that the use of rice bran as a substrate for solid state fermentation can increase the availability of nutrients, phytochemicals and others, which can contribute to the nutritional deficiency in the developing countries [4-8]. According to Vellozo and Fisberg , food fortification is a low cost measure, with rapid implementation and high effectiveness and flexibility, being socially accepted because it does not interfere in population habits. Furthermore, the risks of side effects and toxicity are rare, once the doses used for fortification are minimal and controlled. In this context, the present study aims to investigate the solid state fermentation of rice bran with Rhizopus oryzae as an alternative source of nutrients for human nutrition, thus contributing to environmental and social issues in Brazil. Rice bran and defatted rice bran were provided by industries from Rio Grande do Sul, Brazil. The fungus Rhizopus oryzae CCT 7560 was obtained from the André Tosello Foundation (FAT), Campinas, Brazil. Rhizopus oryzae CCT 7560 cultures were maintained on potato dextrose agar (PDA–HIMEDIA, India) slants at 4°C. Spores were spread by adding 5 mL aqueous emulsion of Tween 80 (0.2% v/v; Synth, Brazil), and incubated for 7 days at 30°C until new fungal sporulation, by the addition of 0.2 mL emulsion in Petri dishes containing potato dextrose agar. Spore suspension for fermentation was achieved by adding 10 mL of aqueous emulsion of Tween 80 (0.2%) to each plate. The release of spores was obtained by scraping the plates with a Drigalski handle, and the concentrated spore’s solution was estimated by enumeration in a Neubauer chamber (Loptik Labor, Tiefe Depth, Basel, Switzerland). A standardized methodology for biomass production was used, as described by Oliveira et al. (2010), consisting of mixing a nutrient solution (2 g.L-1 of KH2PO4 (Nuclear, Brazil) 1 g.L-1 MgSO4 (Synth, Brazil), and 1.8 g.L-1 NH2CONH2 (Vetec, Brazil) in 0.4 M HCl (Synth, Brazil)) and R. oryzae spores suspension at initial concentration of 4 × 106 spores/gbran. The moisture content of the medium was adjusted to 50% with distilled water. The bioreactors were placed in a fermentation chamber (Tecnal, TE-403, São Paulo, Brazil) at 30°C under controlled humidity. After the incubation period (0–96 h, 24-h sampling period), the fermented biomass was stored at −18°C. Fermented and unfermented rice bran samples were characterized according to AOAC methods  for moisture (935.29), protein (920.87; using conversion factor of 5.75), lipids (920.85), and ash content (923.03). Crude fiber was determined by gravimetric method by successive acid and alkaline digestion to isolate the indigestible fraction (962.09). The carbohydrate content was calculated as the difference between 100 and the sum of the percentages of water, protein, lipids, fiber and ash. Fermented and unfermented rice bran samples (~300 mg) were digested by microwave heating in a microwave oven (Speedwave Four, Berghof, Germany), in triplicate, according to the heating ramp as shown in Table 1. Table 1: Heating program of the microwave oven. Samples were digested with 5 mL of concentrated HNO3 (Merck) and 0.5 mL of 40% HF (Merck). After digestion, samples were diluted in 5% HNO3 for subsequent quantification. The determinations were made in inductively coupled plasma optical emission spectrometer Perkin Elmer (Optima 4300 DV, Shelton, USA), and the samples were placed into the sample vial with a GemCone nebulizer and a cyclonic spray chamber, using argon (White Martins, São Paulo, Brazil) as a plasma support gas with purity of 99.996 % (AOAC, 2000). All operating conditions are described in Table 2. Table 2: Equipment operating conditions of ICP OES; * Inductively coupled plasma optical emission spectrometry. The phenolic compounds were extracted in cold methanol (Vetec, Brazil) at a ratio of 1:8 (w/v). The mixture was subjected to orbital shaking (Tecnal TE-141, São Paulo, Brazil) (160 rpm) at room temperature for 2 h. After 15 minutes of resting, further 10 mL solvent was added, followed by agitation for 1 h. The methanolic extracts were evaporated on a rota-evaporator (Quimis®, Q-344B2, São Paulo, Brazil) and the phenolic compounds were resuspended in distilled water. The resulting extract was clarified, centrifuged, and filtered to obtain the phenolic compounds. Total phenolics were quantified in spectrophotometer (Varian Cary 100/UV-Visible, California, EUA) at 750 nm with Folin–Ciocalteau reagent, using gallic acid (Sigma-Aldrich, Japan) as standard (2–30 μg.ml-1) . The results were reported as mean ± SD. One-way Analysis of Variance (ANOVA) was used to determine significant differences between variables. Differences with a probability value of <0.05 were considered significant. Table 3 shows the results of proximate composition of fermented and unfermented rice bran (UF). The chemical composition of rice depends on the agronomic aspects, such as soil, climate, quality of raw material used, and beneficiation process. Protein levels in rice bran can vary from 10 to 15%, which are higher than the values found in wheat and corn . According to Silva et al. , rice bran contains about 11.5% fiber, and is a good source of lipids, once it contains more than 20% its weight in oil (oleic acid, linoleic acid, and esters of palmitic acid). Proximate composition of rice bran and defatted rice bran is shown in Table 3. An increase in lipids, proteins, ash, and fiber was observed during the fermentation period (h). In contrast, carbohydrate levels decreased, as expected, since it was the main source of carbon for microbial growth. Table 3: Proximate composition of rice bran (BI) and defatted rice bran (BD) during fermentation and unfermented bran (UF). With respect to the whole bran (BI), the highest lipid levels were observed within 48 h of fermentation, with no significant differences between the fermentation periods of 72 h and 96 h. Proteins increased more than twice when compared to the UF bran at time zero (0 h), and higher fiber content was observed within 96 h of fermentation, indicating that fermentation is a suitable technique to increase fiber levels. According to Oliveira et al. , the nutrients in the substrate are used to produce the fungal cell wall, with a decrease in the polysaccharide levels. This was demonstrated by the higher fiber and protein levels in the biomass during fermentation, which increased by 400% and 45% for the whole (BI) and defatted bran (BD), respectively, when compared to the unfermented rice bran. A decrease in ash, lipids and carbohydrates levels was observed after 96 h of fermentation, indicating possible lack of nutrients for microbial growth. The defatted bran presented lower fiber content when compared to the UF at the beginning of fermentation, with higher levels within 48 h, and a significant decrease after this time. An increase in ash content was observed in the fermented bran, which may be inherent to fungal growth. Higher lipid contents were observed within 96 h of fermentation, with no significant differences at time zero and after 72 h, while no changes in protein levels were observed at time zero, and after 24 and 72 h.
Among the types of bran studied, the whole bran stood out, with promising results for fiber, ash, lipids, and proteins within 96 h of fermentation time. In addition, there was a reduction in carbohydrates levels, decreasing the caloric value of the bran fermented by Rhizopus oryzae. Ash levels in both fermented and in natura bran were similar to those reported by Kupski et al. , who found 13.9% ash, 11.7% fiber, and 22.1% protein within 96 h of fermentation using the microorganism Rhizopus oryzae and rice bran as substrate. According to Silveira and Furlong , the fungus Rhizopus sp increased the protein levels in defatted rice bran and wheat bran subjected to solid state fermentation by Rhizopus sp. and Aspergillus oryzae . As reported by Irakli et al. , rice bran is an important byproduct and has gained popularity due to its nutritional and biological benefits. It contains phytochemicals such as γ-oryzanol, tocopherols, tocotrienols, and polyphenols, which prevent oxidative damage of body tissue and DNA, and reduce blood cholesterol levels, besides their cardiovascular health benefits and anti-tumor activity. Table 4 presents the mineral levels of rice bran subjected to various fermentation periods with the fungus Rhizopus oryzae. * Not subjected to statistical analysis. 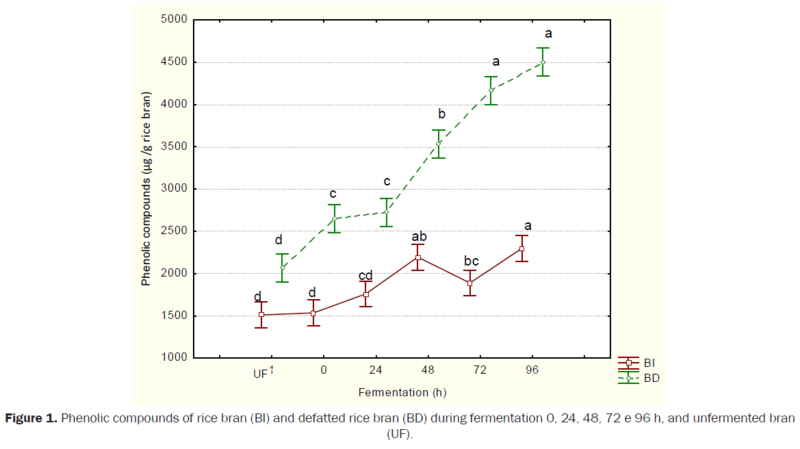 Table 4: Minerals content in rice bran (BI) and defatted rice bran (BD) during fermentation 0, 24, 48, 72 e 96 h, and unfermented bran (UF); Results (μg.g-1) expressed as mean ± SD. Values in lines with the same uppercase letter indicate no significant differences by Tukey’s test (p<0.05). Concerning the results for BI at time zero and after 24, 48, 72 and 96 h in Table 4, an increase in minerals levels was observed at 72 h and 96 h, except for calcium and iron, which were similar to the levels found in the raw material. In relation to the BD, although, an increase in minerals was observed after 96 h, except for calcium and iron, the iron levels decreased significantly in this period. The other fermentation periods under study significantly affected the levels of each mineral, for both BI and BD. Biological or synthetic materials may be transformed to products of interest by fermentation with biological agents. The process uses a microorganism and a source of nutrients, resulting in an increase in nutrients levels until nutrient consumption and process transformation. The variation in ash content between unfermented and fermented biomass occurred due to its use in mycelial synthesis. In addition, with the application of the fungus R. oryzae there was an increase in the bioavailability of the minerals . The time zero (0 h) in this study corresponded to the addition of the substrate to the biological material containing the microorganism, without providing time for metabolic activity. Thus, the comparison between this experimental time and others is extremely important to understand the positive effects of fermentation process on the bioavailability of nutrients. When comparing the mineral levels at time zero and after 96 h of fermentation, higher levels were obtained in the longer fermentation time for both BI and BD, with exception of iron and magnesium. The equal or higher magnesium levels at time zero can be due to the addition of MgSO4 to the nutrient solution for microbial growth, which decreased after 24 h, once this mineral was used as enzyme regulator during fermentation with R. oryzae. Table 5 details the best nutritional sources and the best responses to the mineral profile for rice bran fermented at times 0 to 96 h, with the Daily Recommended Ingestion Index by Ministry of Health of Brazil . Table 5: Values of minerals in rice bran (BI) and defatted rice bran (BD) during fermentation for 0h e 96 h in comparation with the Daily Recommended Ingestion Index; *not subjected to statistical analysis. 1Recommended Daily Intake for adults (BRASIL, 2005); 2Recommended Daily Intake for children between 1 and 10 years old (BRASIL, 2005). Calcium is an essential mineral necessary for performing various biological functions. Studies have demonstrated the association between low calcium intake and chronic diseases, such as osteoporosis, colon cancer, hypertension, and obesity. In Brazil, the calcium intake is below the recommended levels . As shown in Table 5, the fermented BD presented the highest calcium level at 96 h, followed by fermented BI. Sodium is normally found in foods in the form of sodium chloride, and is an essential mineral for several vital body functions such as muscle contraction, blood pressure maintenance, nerve transmission, and fluid balance. Although sodium chloride also known as salt or white gold is associated with healthy properties, once it is derived from salus and salubris, currently the high consumption of this mineral may trigger various disorders in the body, such as cardiovascular disease and stroke, independently associated with increased blood pressure . Among all samples studied by our research group, the highest calcium values were found in fermented BD and fermented BI, corresponding to 0.15 and 0.2% of RDI for adults, respectively. Magnesium, phosphorus, and sulfur are vital components to the human body, together with the macro minerals previously mentioned. Magnesium is a constituent of many coenzymes and essential for the normal functioning of the nerves and muscles; phosphorus participates in the formation of bones and teeth, and energy for cellular reactions in the form of ATP (Adenosine triphosphate), among other functions, and sulfur participates in the structure of many proteins. The use of phosphorus of plant origin by monogastric animals is directly related to its phytate level, since phosphorus is not digested by these animals, due to absence of the enzyme phytase in their digestive tracts. The fungus Rhizopus oryzae can produce the enzyme phytase during fermentation [5,19]. This hydrolyzes phytate from bran, releasing phosphorus. Magnesium level was significantly higher in both fermented and unfermented bran, while phosphorous and sulfur levels were higher in fermented bran (whole and defatted). Iron is an essential micronutrient present in many foods, and 60 to 70% of the total iron in humans is associated with the hemoglobin. There are several iron-rich foods, including wheat germ, parsley leaf, oatmeal, spinach, rice, legumes in general, carrots, kale, and cabbage, among others. Cereal and grains present quite similar iron concentrations, with values ranging from 25 to 80 μg.g-1. When considering the food known as source of iron as reference, such as raw liver (56 μg Fe.g-1), brindle raw beans (18.6 μg Fe.g-1), and brown sugar (8.6 μg Fe.g-1) [20,21], rice bran may be a representative source of this mineral, especially the BD of the present study. In this research, the fermented BI has proven to be an excellent source of chromium (1 g of biomass is able to supply 7% and 22% of the RDI for adults and children, respectively) and zinc (1.5% and 2.7% of the RDI for adults and children, respectively). Chromium is associated with the maintenance of glucose metabolism, possibly due to the insulin actions at the cellular level, affecting the metabolism of carbohydrates, lipids, and proteins. Zinc is a structural and/or functional component of many metalloenzymes and metalloproteins, and is part of many cellular metabolism reactions, including physiological processes, such as immune function, antioxidant protection, growth and development . Copper can be found in biological tissues in the form of organic complexes, such as metalloproteins with enzymatic activity. The use of oxygen for cell respiration, energy use, and synthesis of essential compounds are examples of metabolic reactions mediated by enzymes that require copper as cofactor for their catalytic activity. Manganese participates in the formation of connective and bone tissues, growth and reproduction, and in the metabolism of carbohydrates and lipids . Thus, both minerals are considered essential for human metabolism even though at low concentrations. BI and BD have proven to be an excellent source of copper and manganese, representing about 1.5% and 3.5%, and 12 and 22% of RDI for adults and children, respectively. According to Chaud et al. , in relation to the minerals composition, rice bran is extremely rich in phosphorus, manganese, copper, iron and zinc, but is low in calcium, as observed for other brans. The rice bran evaluated in this study was rich in these minerals, with increased levels in both BI and fermented BD. There are few studies on minerals levels in rice bran, once only ash contents have been investigated. Faria et al. determined minerals levels in rice bran subjected to different preservation methods, such as microwave and conventional oven. Higher calcium (733 μg.g-1) and iron (115 μg.g-1) levels were found in rice bran subjected to microwave heating when compared to the other treatments. Lacerda et al. determined calcium, magnesium, potassium, phosphorus, iron, copper, zinc, and manganese in raw, parboiled, and extruded rice bran, and the latter showed the highest mineral levels, with the exception of magnesium, potassium and iron. Kraler et al. assessed the in vivo bioavailability of minerals in fermented extruded wheat bran, and concluded that those preservation methods have an influence on the availability of nutrients. This study demonstrated the important role of rice bran not only for animal feed and extraction of nutrients of interest, but also as a possible alternative for human nutrition. Protein, fiber, lipids, and minerals levels have increased after fermentation, thus enriching the final product. Figure 1 shows the extraction of phenolic compounds by the fungus Rhizopus oryzae the fermentation period. Figure 1: Phenolic compounds of rice bran (BI) and defatted rice bran (BD) during fermentation 0, 24, 48, 72 e 96 h, and unfermented bran (UF). A significant increase in phenolic compounds was observed after 48 h of fermentation for both BI and BD, and the BD biomass, which showed the highest phenolics levels (Figure 1), probably due to the use of defatted rice bran as a substrate [5,6], once some phenolic acids are linked to polysaccharides, lignin and suberin, which are components of cell wall of grains. Phenolic compounds in rice bran exist in three forms, namely soluble-free, soluble-conjugated, and insoluble, and are shown to be formed by two alternative routes such as decomposition of lignin, cellulose and hemicellulose, or production of rice bran oil. The increase in phenolics during fermentation is mainly due to the cleavage of compounds complexed with lignin [14,28]. Phenolic compounds play physiological activities, preventing the generation of reactive oxygen species, which in turn, contributes to the reduction of oxidative stress in cardiovascular disease, neurodegenerative, cancer, among others . Similar results were reported by [7,14,30],who studied solid state fermentation of rice bran by Rhizopus oryzae, and found doubled content of phenolic compounds. Dey and Kuhad  studied the extraction of phenolic compounds by solid state fermentation of wheat by Rhizopus oryzae using different extraction conditions. Razak et al. studied the effect of solid-state fermentation using single and mixed cultures of Rhizopus oligosporus and Monascus purpureus on the increase in phenolics levels in rice bran when compared to the unfermented bran . The present study showed that the fermentation process by the filamentous fungi Rhizopus oryzae positively affected the proximate composition of the bran, increasing fiber, ash, proteins, and lipids levels. Similar behavior was observed for the mineral levels, both in whole and defatted bran, especially throughout 96 h of fermentation. When considering only the fermentation time of 96 h, the fermented bran (BI) achieved the recommended daily intake, with exception of calcium levels, when compared to the fermented defatted bran (BD). After fermentation, the phenolic compounds increased for both bran samples, and defatted bran stood out for increasing phenolics levels by 100%. Therefore, rice bran has proven to be a promising alternative for human nutrition. The authors acknowledge CAPES (process n. 23038.029595/2009), CNPq (process n. 472562/2012-6) and FAPERGS (process n. 2485.271.13638.270202013) for the financial support. Avila LA. de, et al. Arroz: composição e características nutricionais. Cien Rural. 2008;38:1184-1192. Schmidell W, et al. Biotecnologia Industrial., São Paulo, Edgard Blücher Ltda. 2001. Gul K, et al. Rice bran: Nutritional values and its emerging potential for development of functional food-A review. Bioact Carbohydr Dietary Fibre. 2015;6:24-30. Feddern V, et al. Efeitos da fermentação nas propriedades físico-químicas e nutricionais do farelo de arroz. Ciênc Tecnol Aliment. 2007;27:800-804. Oliveira MS, et al. Physico-chemical characterization of fermented rice bran biomass. CyTA J Food. 2010;8:229-236. Silveira CM and Furlong EB. Caracterização de compostos nitrogenados presentes em farelos fermentados em estado sólido. Ciênc Tecnol Aliment. 2007;27:805-811. Schmidt CG, et al. Antioxidant activity and enzyme inhibition of phenolic acids from fermented rice bran with fungus Rizhopus oryzae. Food Chem. 2014;146: 371–377. Thomas, L, et al. Current developments in solid-state fermentation. Biochem Eng J. 2013;81:146–161. Vellozo EP and Fisberg MO. Impacto da fortificação de alimentos na prevenção da deficiência de ferro. Rev Bras Hematol Hemoter. 2010;32:134-139. AOAC. (2000). Association of Official Analytical Chemists. Official methods of analysis of AOAC International, 14th ed. Washington. Souza MM, et al. Estudo das condições de extração de compostos fenólicos de cebola (Allium cepa L.). Ver Inst Adolf Lutz. 2009;68:192-200. Friedman M. Rice Brans, Rice Bran Oils, and Rice Hulls: Composition, Food and Industrial Uses, and Bioactivities in Humans, Animals, and Cells. J Agric Food Chem.2013; 61:10626-10641. Silva MA, et al. Prevention of Hydrolytic rancidity in rice bran. J Food Eng. 2006;75:487-491. Kupski L, et al. Solid-State Fermentation for the Enrichment and Extraction of Proteins and Antioxidant Compounds in Rice Bran by Rhizopus oryzae. Braz. Arch. Biol. Technol., 2012;55:937-942. Lio J and Wang T. Solid-state fermentation of soybean and corn processing coproducts for potential feed improvement. See comment in PubMed Commons below J Agric Food Chem 2012;60:7702-7709. Irakli M, et al. Evaluation of quality attributes, nutraceutical components and antioxidant potential of wheat bread substituted with rice bran. J Cereal Sci. 2015;65:74-80. Brasil-Agência Nacional de Vigilância Sanitária (2005) Regulamento técnico sobre ingestão diária recomendada (IDR) de proteínas, vitaminas e minerais. 2016. Sarno F, et al. Estimativa de consumo de sódio pela população brasileira, 2008-2009. Rev Saúde Públ. 2013;47: 571-578. Lennartsson PR and Taherzadeh MJ (2014). Rhizopus. In: Encyclopedia of food microbiology, Batt, C.A. ; Tortorello, M.L. (Eds. ), Vol 3., Elsevier, ISBN: 978-0123847331, 284-290. TACO. Tabela Brasileira de Composição de Alimentos. (2011). Núcleo de Estudos e Pesquisas em Alimentação -NEPA Universidade Estadual de Campinas, quarta ed. 161.2011. IRGA-Instituto Rio Grandense do Arroz (2016). Setor Produtivo: Plantio do arroz safra 2015/16. Casey CE and Walravens PA. Nutrition during infancy. Philadelphia: Hanley E Belfus. 126.1988. Predraza DF, et al. Zinc nutritional status in children attending public daycare centers in the state of Paraiba, Brasil. Rev Nutr.2011;24:539-552. Chaud LCS, et al. Potencial do farelo de arroz para utilização em bioprocessos. Nucleus. 2009;6: 33-46. Faria, S.A. et al. Nutritional composition of rice bran submitted to different stabilization procedures. Braz J Pharm Sci,2012; 48: 651-657. Lacerda DBCL, et al. Qualidade de farelos de arroz cru, extrusado e parboilizado. Rev Pesq Agropec Trop. 2010;40:521-530. Kraler M, et al. Effects of fermented and extruded wheat bran on total tractapparent digestibility of nutrients, minerals and energyin growing pigs. Anim Feed Sci Technol. 2014;197:121–129. Schmidt CG and Furlong EB. Effect of particle size and ammonium sulfate concentration on rice bran fermentation with the fungus Rhizopus oryzae. Biores Technol. 2014;123:36-41. Contreras-Calderon J, et al. Antioxidant capacity, phenolic content and vitamin C in pulp, peel and seed from 24 exotic fruits from Colombia. Food Res Int. 2011;44:2047–2053. Christ-Ribeiro A, et al. Antifungal compounds extracted from rice bran fermentation applied to bakery product conservation. Acta Scientiarum Technology (Online), 39, In press. 2017. Dey TB and Kuhad RC. Enhanced production and extraction of phenolic compounds from wheat by solid-state fermentation with Rhizopus oryzae RCK2012. Biotechnol Rep. 2014;4:120-127. Razak DLA., et al. Enhancement of phenolic acid content and antioxidant activity of rice bran fermented with Rhizopus oligosporus and Monascus purpureus. Biocatal Agric Biotechnol. 2015;4:33-38. Ryan EP, et al. Rice Bran Fermented with Saccharomyces boulardii Generates Novel Metabolite Profiles with Bioactivity. J Agric Food Chem. 2011;59:1862–1870.